There’s a magical thought that pixie dust, along with happy thoughts, grants kids the ability to fly. 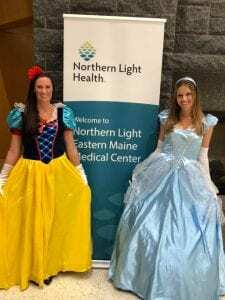 And, we’re so thankful to our friends Cinderella and Snow White, from the Courtyard by Marriott Bangor and the Marriott TownePlace Suites Bangor, for stopping by Northern Light Eastern Maine Medical Center’s Inpatient Pediatrics this morning and spreading some pixie dust wishes. Cinderella and Snow White sure brought smiles to our patients’ faces, and our staff, too! Thank you, Marriott!